Momentary Ministers . . . Most people think it takes a long time--years, months or even days to accomplish something profound, something great for God. The truth of the matter is that church greeters have this opportunity every time someone walks through the doors of their church. Greeters have the awesome ability and opportunity to be an ambassador for the Lord. The pastor's vision is carried on and his ministry is extended through these everyday people. Sound exciting. It is ! 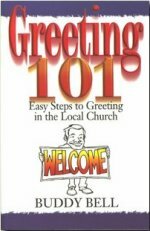 Learn how to be an outstanding greeter in your local church and start doing something great for God today!